What makes a successful stakeholder event? Each internationally operating B2B company has its unique market situation and needs. The recipe for achieving the goals includes setting a clear objective, creative but careful planning, professional coordination and smooth implementation in close cooperation with a responsible exhibition and events expert. 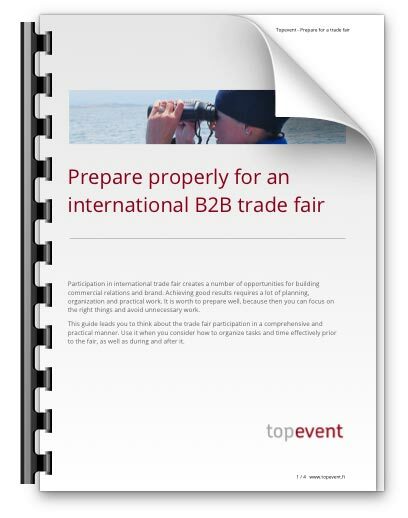 Topevent specializes in Finnish B2B companies’ international trade fairs and stakeholder events. The most important trade fairs of many important industries worldwide take place in Germany. 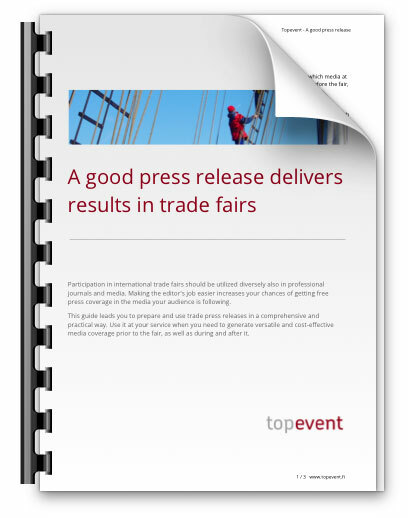 Take advantage of Topevent’s industry expertise, extensive experience and networks, especially if you plan to participate trade fairs in Germany or other European countries.